We believers face a constant temptation. We so easily gravitate toward seeking life from things other than Jesus Christ. In his most recent book, Benefit of the Doubt: Breaking the Idol of Certainty, Greg Boyd asks Christians to consider what we go to for our life. He suggests that many believers are seeking life from their own feeling of certainty. This is often based on a poor understanding of faith. There is a mistaken idea that faith means essentially the same thing as certainty. So having strong faith means being absolutely certain in your beliefs about God, making doubt the Christian’s enemy. Boyd soundly debunks this view of faith—both philosophically and biblically. Far too many Christians have made certainty an idol. Thus they become incensed and defensive whenever someone challenges their views. Their source of life comes from their supposed theological accuracy, rather than from Christ alone. Boyd challenges such believers to rethink their view of faith, offering a much more biblical model. Faith is not certainty of belief. Rather, faith is a commitment. For the Christian, faith is a covenantal relationship with Jesus Christ. It is the commitment to live as if Jesus is Lord and Savior, even during times when we may not be certain. This is a truth the church desperately needs to hear and heed. Greg Boyd is a controversial figure, and many will object to certain elements in this book. I can’t say that I personally agree with every detail Boyd presents. Nonetheless, the primary message he conveys is a vital one. We must gain a biblical understanding of faith. We must abandon our idol of certainty. And we must come to Jesus Christ as our one and only source of life. 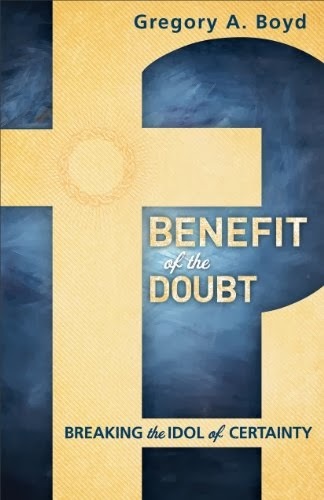 I would like to thank Baker Books for being kind enough to send me a free copy of Benefit of the Doubt to review. Pick up your copy as a paperback or a Kindle eBook.